This may come as a shocker to all of you, but "buy here, pay here" dealerships sometimes engage in predatory and illegal practices. The Consumer Financial Protection Bureau has fined the nations largest "buy here, pay here" dealership group for allegedly harassing customers. According to a report at Credit.com, the CFPB issued a $8 million civil penalty against Drive Time, a national chain of used car dealers, after an investigation by federal authorities found it had repeatedly harassed consumers and incorrectly reported information the credit bureaus. Consumers were called at work and DriveTime refused to honor no-contact requests, required under the Fair Debt Collection Practices Act. "One consumer was unfairly called 30 times at work after her do-not-call request," the CFPB said. 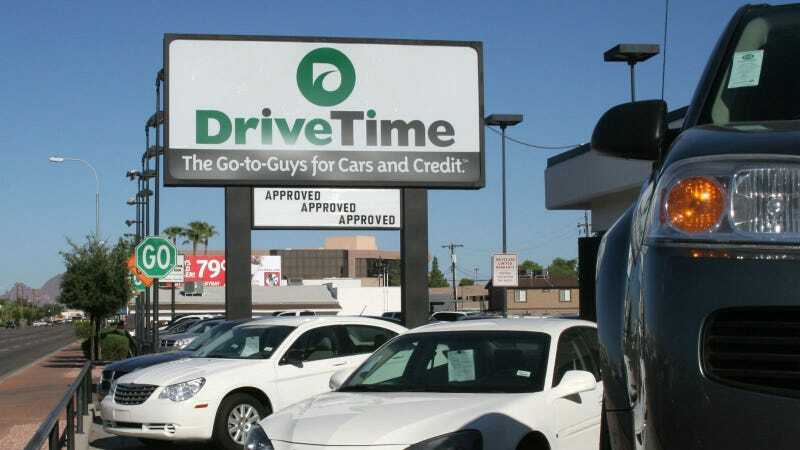 DriveTime requires consumers to provide at least four references when they apply for financing; the firm called these references "for months" while attempting to collect debts, even after buyers asked DriveTime to stop, according to the CFPB. DriveTime inaccurately reported collections information to credit bureaus — in some cases making repossessions appear more recent than they really were, damaging consumers' credit scores. The firm also did a poor job of correcting inaccurate information on credit reports. "DriveTime informed the consumers in writing that the information had been corrected, when it had not been," the CFPB said. For those with bad credit, "buy here, pay here" dealerships sometimes offer the only way to purchase a vehicle. These dealers often thrive upon high interest rates and repossessions. So if you have shaky credit, try to scrounge up some cash and lay it down on something cheap. You won't have to worry about a loan at 20 percent, a shady lender won't call your office, and no one will be able to take your car.